Northampton's training will get more intense now they are five points clear at the top of League Two, according to assistant manager Alan Knill. 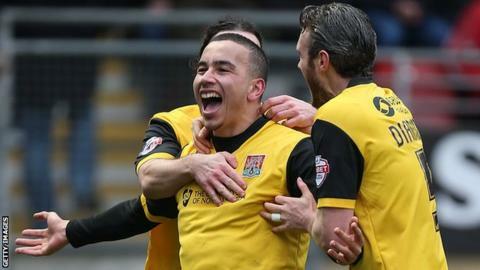 The Cobblers, with seven straight league wins, face Oxford on Tuesday. "We've tried to get into the players that you only get accolades for working hard," Knill told BBC Look East. "We believe we work as hard as, if not more than, any other team in the league. The minute we stop that we're not a top-seven team." He continued: "If anything our training is becoming more intense. We just felt we needed that. Instead of easing off we'll go the other way and keep the hammer down and push the players even more. "We've worked so hard to get into this position, the last thing we want to do is let it go." Saturday's 4-0 victory over play-off hopefuls Leyton Orient came before a clash against third-placed Oxford, the side manager Chris Wilder was in charge of before he moved to Sixfields Stadium. Earlier this season, the Cobblers faced an uncertain future, with players and staff not being paid by the club and the fourth division side itself facing a winding-up petition before Kelvin Thomas' takeover in late November. Despite the off-field issues, the Cobblers continued a push towards promotion. "This season, especially the last three months, has been really enjoyable. The players are playing with a real freedom and we are scoring goals," said Knill. "Myself and Chris have walked off a couple of times and said to each other 'I really enjoyed that today'."